VIETRI is the largest importer of exclusively Italian handcrafted products for the better specialty market. The magic of Italy, the skilled artisans and their enthusiastic customers keep them vibrant and passionate about bringing Italy's best in creations, colors and design to the retail market. 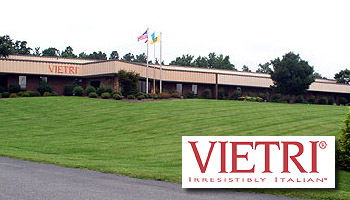 VIETRI needed to revamp their web site, add ecommerce software functionality, and at the same time, make it faster, more dynamic, and easier to manage, including automated updates directly from their back-office AS400 system. Working closely with VIETRI's in-house design team and marketing department, we created the technology to support VIETRI's vision of their new site. 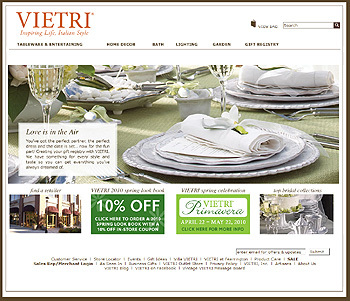 Building upon our ecommerce software, we created a fully customized system to support VIETRI's needs. Among the various custom solutions that VIETRI required were a retail store locator, a dynamic corporate events calendar, and customized integration with their existing merchant and sales representative systems. In order for VIETRI's online ecomerce catalog to be as up-to-date as possible, we created a system to import data by directly interfacing with their back-office system. VIETRI's customized solution and back-office inter-operability are proof that custom ecommerce software need not be expensive to be effective. Contact us today about your custom ecommerce software needs.